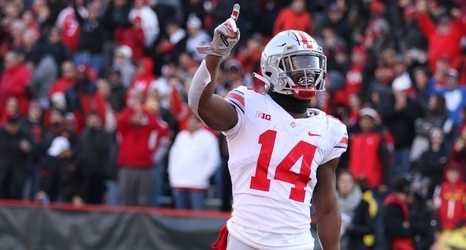 As he made his decision of whether he should enter the 2019 NFL draft or stay at Ohio State for his fifth-year senior season, K.J. Hill had plenty of people he could turn to for guidance. Three of his fellow Ohio State wide receivers – Parris Campbell, Johnnie Dixon and Terry McLaurin – had to make the same decision one year earlier. All of them gave consideration to entering the 2018 NFL draft before deciding to return to the Buckeyes for their fifth-year senior seasons. Like his teammate Damon Arnette, Hill also consulted with former Ohio State wide receiver and Pro Football Hall of Fame enshrinee Cris Carter before making his decision.